I hope everyone is gearing up for an awesome weekend :) This one promises to be rainy for us in Brisbane which is great for the garden so I am not complaining! I am of course here to share this week's AnnaBelle Stamps challenge with you, however before I do I have an announcement to make - this week's challenge will be my last as a DT Belle for AnnaBelle Stamps. I'm very sad to be leaving the team - all of the Belles are so talented and absolutely the loveliest ladies you could ever hope to meet, but life has been a bit hectic lately and crafting needs to take a backseat for the moment. Thanks so much to Andrea for letting be a part of your awesome team and letting me work with your awesome designs. 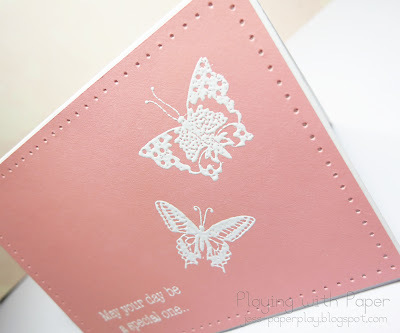 I used AnnaBelle Stamps white cardstock for the base, Carnation Hero Arts layering paper for the stamping and piercing layer, and butterflies and a sentiment from the All Things Grow set. I white embossed the sentiment and butterflies and then created the border using a ruler and a paper piercer. 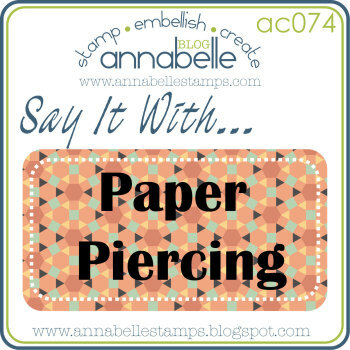 Each weeks winner will receive our special blinkie to display on their blog and a $10.00 Gift Voucher to spend in store at AnnaBelle Stamps (or something equivalent). Please don't link to postings made prior to the date of our current challenge. All projects submitted must be new. It's a sad day for the team, we will miss your gorgeous CAS style and I wish you all the very best for wherever life is leading you. I also look forward to 'seeing' you in cyberspace! Hugs Therese. ps you have really gone out with a bang, this card is CAS perfection Jess! I agree with Therese, it's a sad day for us all and we will miss you Jess. Your sweet CAS cards are an inspiration. I hope things go well for you and that we will still see your beautiful cards around the blogs! Jess I really love your card...I was going to use those butterflies myself, but didn't in the end. You will be missed...hopefully you will still be around from time to time and show off your beautiful and CAS style. Take care. This is just beautiful Jess! 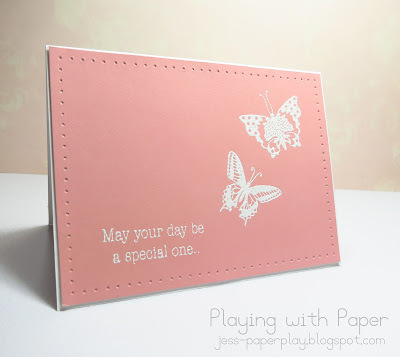 I love the white embossing on pink! This is one simply beautiful card, Jess! 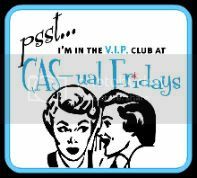 You will be such a lost to the AnnaBelle team and I for one will miss your gorgeous CAS style! Hi Jess, I featured your digi stamps posts on my Facebook page by linking to your digi page. I first found your blog through Craft Gossip. Your sentiments are adorable!